Photograph from Time, May 3, 1993. Here is the concrete room, designated "the bunker" by military/FBI psychological operations personnel. The utter darkness within testifies to the integrity of the roof and the other three walls. As mentioned in the War Gallery, the military assailants of the Mt. 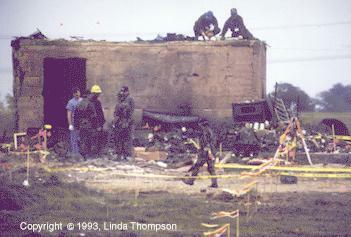 Carmel Center used the terms of war to describe the Branch Davidians and their home. Among these words were: bunker, lookout tower, watchtower, fortified, fortress, ambush, and cease fire. Meanwhile, US forces used the weapons of war--armed helicopters and grenades--but used the terms of law enforcement. Among those words were search warrant, affidavit, arrest, law officer, and law enforcement. This is the sort of Orwellian detail with which the whole incident is replete, and hardly any discussion of the subject is possible now without touching on those terms. In this tradition, the underground tornado shelters of Mt. 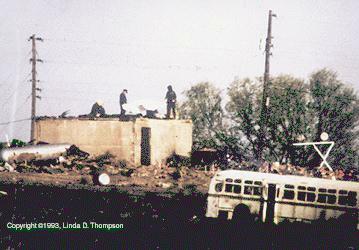 Carmel were dubbed "underground bunkers," as though the Davidians had prepared a defense against the attack. Prior to the April 19 fire, these were the only "bunkers" mentioned by the news services, commentators, FBI spokespersons, etc. But after the fire, the term "bunker" was redefined to refer to a concrete room that formed the foundation of the of the four-story residential tower. This concrete room had originally been built as a vault many years before as part of an earlier structure. It measured nineteen by twenty feet, and consisted of four walls with no windows, a floor, and a roof that was made of six inch steel-reinforced concrete or "rebar." In recent years the single door had been removed and a walk-in refrigerator, measuring eight by four feet, had been added. The area now formed a cul-de-sac. The ATF drawings of the area made before the raid bear the notations "dry food," "ref.," and "food storage" to describe the space (see Dumb Diagram of Mt. Carmel, First Floor). 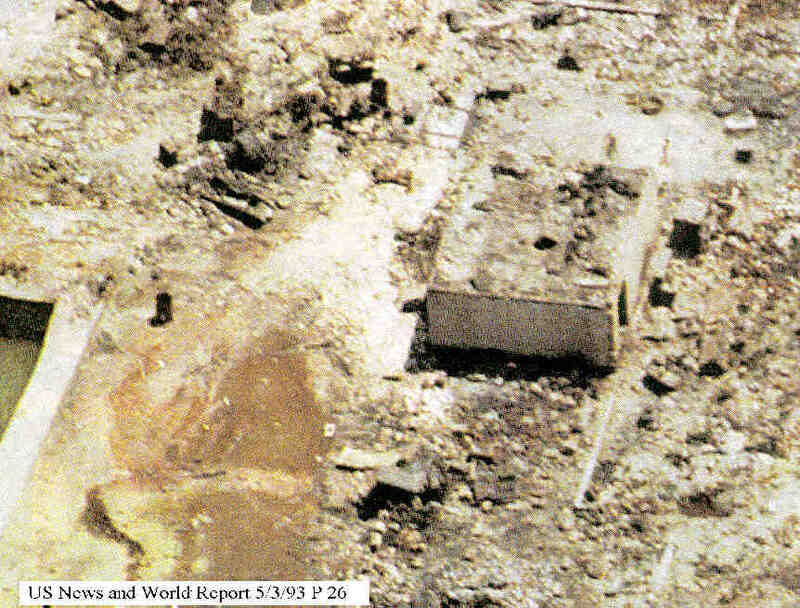 Here is written evidence that the US government knew the area was not a "bunker." The term "bunker" commonly refers to a fortified structure or earthwork from which occupants may operate a gun emplacement or return fire. None of the underground shelters nor the above-ground concrete room contained capability for either of these activities. The below ground shelters could provide hiding places from a storm, but there was nothing of them above ground to provide a place from which to shoot. The above ground concrete room in particular was unsuitable for any sort of military purpose: it was surrounded on three sides by the residential wooden building and contained no windows or peep holes for sniping. Nevertheless, following April 19, all government agents and news services referred to the concrete room as the "bunker." 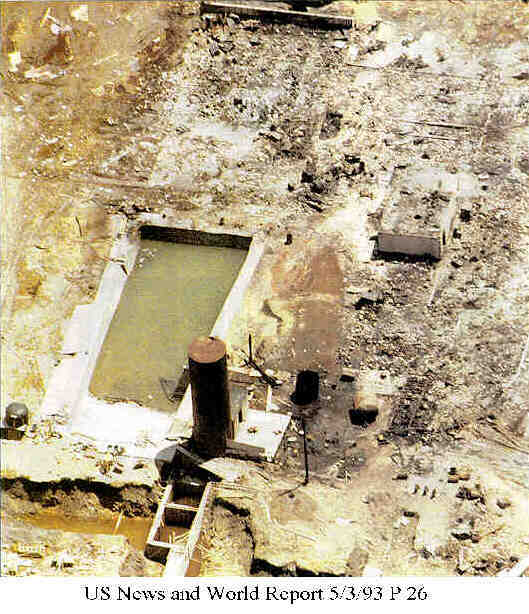 We will now look at Dr. Nizam Peerwani's assertion that the "bunker" collapsed. The word "collapse" carries with it the notion of sudden and complete ruin. The word "erode" carries with it the notion of gradual falling away from the original form. Dr. Peerwani obviously understood what "collapse" meant, because he attributed burial, suffocation, and blunt force trauma deaths to the collapse of the building. 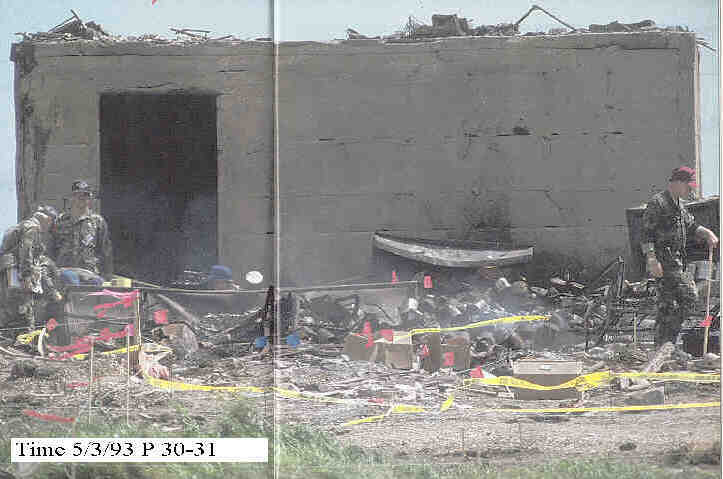 The problem for Dr. Peerwani, the ATF, the FBI, the Justice Department, the US military, and America is this: The concrete room did not collapse. 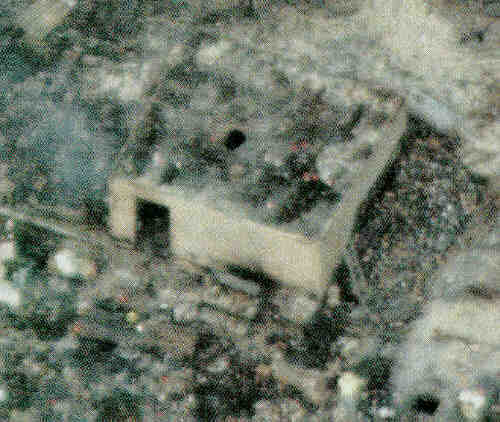 Aerial photos of the concrete room taken after the fire show the structure standing and the roof still in place. 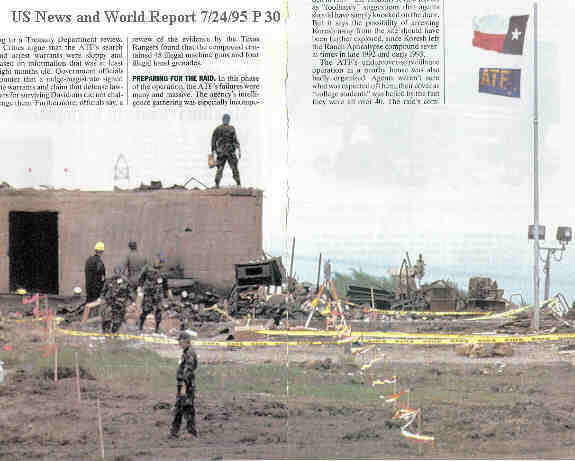 A small hole, measuring perhaps two feet in diameter, can be seen toward the center, as shown in contemporaneous news magazine photos (US News & World Report, May 3, 1993, pg. 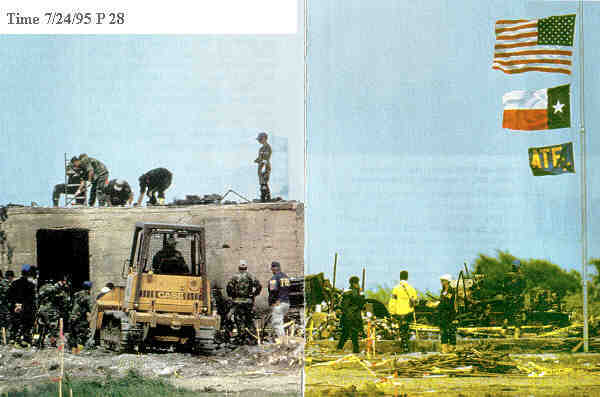 26 and Newsweek, May 3, 1993; both of these illustrations are magnifications of the original published photographs, original scale US News & World Report, May 3, 1993 and original scale Newsweek, May 3, 1993). There seems to be an irregular circular pattern around the hole, possibly seven feet in diameter, suggesting that the roof was weakened in that area. figure 11, donated to Museum from unofficial source. 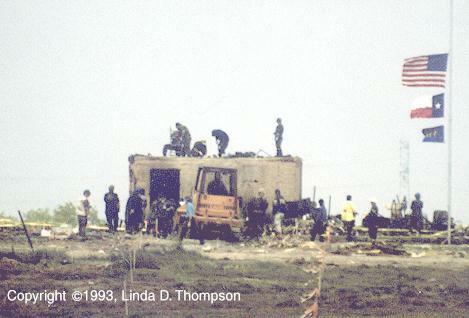 There are at least five men on top of the roof of the concrete room in Time, July 24, 1995, pg. 28; also see figure 8, and figure 11. The stances the men assumed while on the roof suggest they were not unduly concerned about the structure's stability. 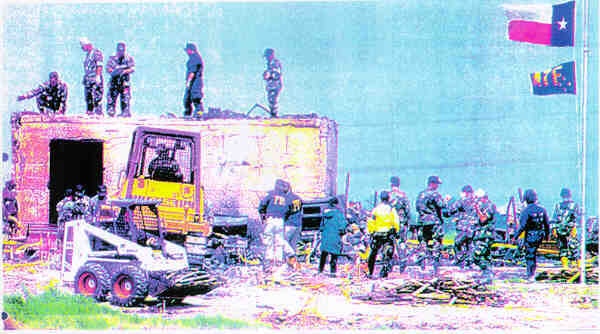 Nine bodies were found on the top of the uncollapsed, but damaged, roof. US News & World Report, May 3, 1993, pg. 34 shows men removing the bodies. 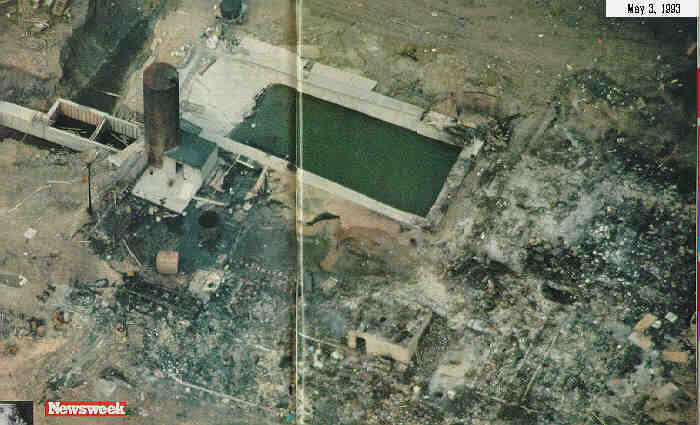 Debris from the upper floors, now burned away, rests on the uncollapsed roof of the concrete room in Time, May 3, 1993, pgs. 30-31. 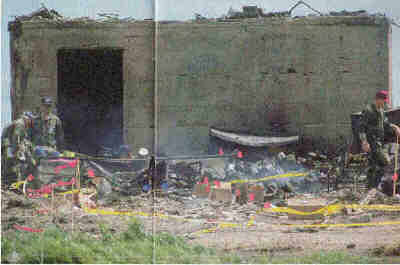 Except for some minor damage to an outside corner just left of the doorway, three visible walls are intact (see US News & World Report and Newsweek, May 3, 1993). Had there been major damage to the fourth wall, the one opposite the doorway, we would have seen light shining through the doorway in Time, May 3, 1993, pgs. 30-31 and US News & World Report, July 24, 1995 pg. 30. Sgt. Raymond L. Coffman was the Texas Ranger in charge of the crime scene in the concrete room. He became intimately familiar with physical attributes of that room and its roof, and described what he saw to the jury during the 1994 San Antonio trial of the Branch Davidians. The initial hole was "pretty small," Sgt. Coffman said. "And . . . the hole just got bigger and bigger and bigger" as men moved on the roof day after day (Transcript, pg. 938 and 939). Sgt. Coffman said: " . . it started out probably 18 to 24 inches across and progressively got bigger." (Transcript, pg. 943 and 944). Here is a picture of the hole, with the rebar exposed (Hole in Roof of Concrete Room), donated to the Museum by an unofficial source. Note the crumbling concrete around the edges of the hole. Note also how clean the rebar is of concrete. 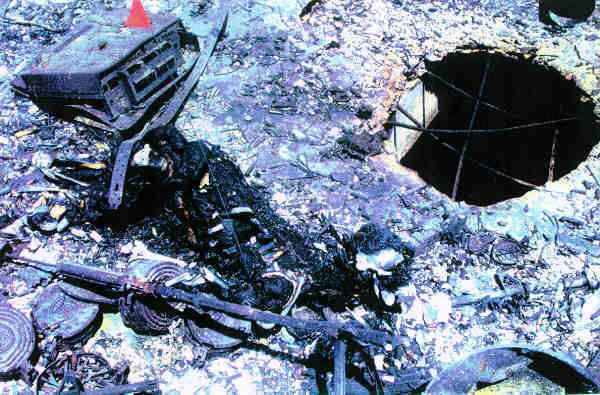 These two factors suggest the material integrity of the concrete was destroyed by the agency that made the hole; this was perhaps a high frequency explosive or very high heat. If Sgt. 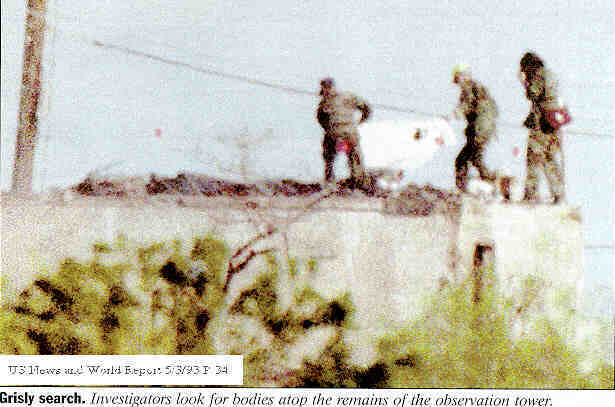 Coffman was in control of the crime scene and would allow only one or two men on the roof at a time, who are these five people on top of the roof in Time, July 24, 1995, pg. 28, figure 8, and figure 11. Ten to twelve people whose remains were found in the concrete room were said by the Tarrant County medical examiners office to have died from either suffocation or blunt force trauma as a result of "structural collapse." The names of Smithsonian Institution forensic anthropologists Drs. Ubelaker and Owsley appear on the Autopsy Reports as having done the anthropology examinations. Cyrus Howell Koresh, (Mt. Carmel Doe 67-2 --"probably" suffocation due to structural collapse). As we have just seen, there was no structural collapse. Therefore, these 10 to 12 people must have died from different causes and under different circumstances. But these bodies have undergone severe mangling with limbs "sheared" off, trunks severed, skulls crushed, and bodies pulped into unrecognizable shapes. Since this concrete room did not collapse, how and where were the bodies mangled? Was the mangling a cause of death, or were the corpses mangled after death? These questions are now open. The question of false death certificates is also raised. False information on a death certificate is a very serious fraud on the court. We shall see now how the evidence beneath the roof was tainted and how the "structural collapse" lie found its way into the Autopsy Reports--all to provide plausible denial for the US military and paramilitary secret police of the FBI and ATF.